Fat pearl grafting is a technique that can help patients who have hollow upper or lower eyelids. This is most commonly used for the management of patients who have undergone an excessive removal of fat during the course of cosmetic eyelid surgery (blepharoplasty) undertaken by plastic surgeons elsewhere, but it can also be used for patients who have hollowing as an hereditary problem, as a result of aging, as a consequence of previous trauma, or due to disorders such as Rhomberg’s hemifacial atrophy. It can also be combined with microfat grafting to the temple and cheeks. Fat for fat pearl grafting is taken via an incision which is typically made around the lower half of the umbilicus (the tummy button). Other donor sites can be used if preferred. The fat is then divided into very small “pearls” and transplanted into the eyelid, usually via a skin crease incision in the upper eyelid and via a transconjunctival incision (on the inside of the eyelid) in the lower eyelid. The overall results of this surgery are good and long lasting. The results are not, however, as good in smokers. Patients are advised to discontinue smoking for a few months prior to this surgery. This surgery is usually undertaken under “twilight anaesthesia” on a day case basis. This surgery is undertaken on a frequent basis by Mr Leatherbarrow. The lack of patient photographs for this procedure reflects the fact that patients undergoing this surgery do not want their photographs to be viewed by others and their wishes are entirely respected. What are the possible complications of fat pearl grafting? Damage to the muscles that move the eyeball (e.g. the inferior oblique muscle from the use of cautery to seal a bleeding blood vessel adjacent to the muscle) causing double vision is an extremely rare problem and this usually resolves by itself with time. 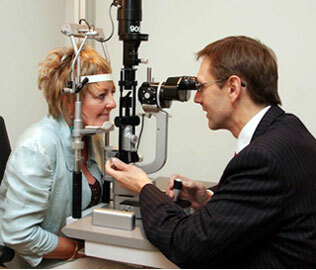 In the very unlikely event that double vision were to persist, a referral to another ophthalmic surgeon with expertise in the management of eye movement disorders and possible further surgical intervention would be required. A ptosis (the upper eyelid does not open because of stretching of the muscle or tendon that controls it). Another operation may be necessary to repair this. An oculoplastic surgeon undertakes ptosis surgery routinely. A higher lower lid position. Rarely, the lower eyelids may remain slightly high following a lower lid transconjunctival approach if the eyelid retractors are not sutured (stitched) or if excessive swelling causes cheese-wiring of the sutures. The eyelid may not move downwards properly when looking down, requiring a chin down posture to compensate for this. Atrophy of the transplanted fat. This is rare but is the reason why the procedure is not advised in smokers who have a poor microvasculature. The procedure can be repeated if necessary. Granuloma. A pink fleshy lump can occur as a stitch reaction on the inside of the lower eyelid following a transconjunctival blepharoplasty. This often resolves with the use of a course of postoperative steroid eye drops but occasionally the granuloma needs to be removed surgically in the clinic or operating theatre. What happens after fat pearl grafting? You will be asked to clean the eyelids very gently using clean cotton wool and Normasol (sterile saline) or cooled boiled water and repeat the application of antibiotic ointment (usually Chloramphenicol or Soframycin) to the wounds 3 times a day for 2 weeks. The sutures used are dissolvable but are usually removed in clinic after 2 weeks. The skin around the eyes should be protected from direct sunlight, by avoidance if possible or by using protective sunglasses. Wearing make-up should be avoided for at least 2 weeks. After 2 weeks the use of mineral make-up is recommended. (The aesthetics nurses at the clinic Face & Eye can demonstrate this to you). It is important to devote a lot of time to your aftercare for the first 2 weeks and some patients find this somewhat labour intensive. The scars gradually fade to fine white marks within a few months. Those in the upper eyelid are hidden within the skin crease. It is often recommended that you use Lacrilube ointment to the eyes 2 hourly for the first 48 hours after surgery following any upper lid surgery but note that this will cause blurring of vision. (You should not drive for the first few days after surgery). These medications can be purchased from my clinic Face & Eye or online from the clinic’s online shop (www.faceandeyeshop.co.uk). 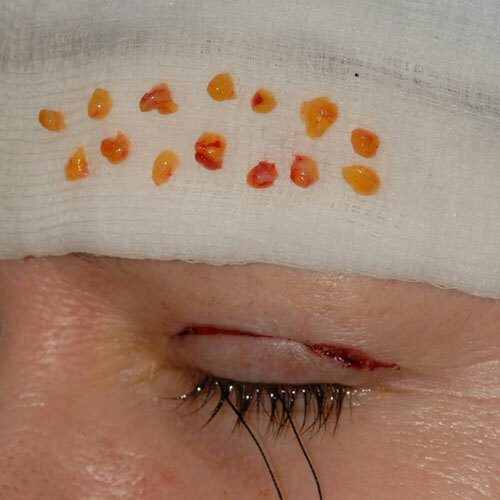 A period of postoperative massage is often advised following lower eyelid surgery. You will be shown how to do this. It is usually undertaken after applying some Xailin ointment to the eyelid skin. The massage helps to reduce swelling. It is usually undertaken for 3 minutes 3 times a day in an upward and side to side direction. Shortly before moving to the operating room, a small tube (cannula) is placed into a vein in the back of your hand by the consultant anaesthetist and the anaesthetic drugs are given through that. These are Midazolam (a short acting type of Valium) and Propofol, a drug which is also used for general anaesthesia but, for conscious sedation, much lower doses are used. With conscious sedation there is no breathing tube or breathing machine, just a gentle flow of oxygen given through a plastic tube within a soft sponge protector inserted into one of your nostrils. Once the sedation has been commenced a local anaesthetic solution (a mixture of Marcaine and Lignocaine) is injected into the operative area to ensure a painless procedure. Typical side effects of general anaesthesia including a sore throat and nausea are avoided. Waking up takes only a few minutes at the completion of the surgery and is usually free of any “grogginess.” This type of anaesthesia has been used safely and successfully for our surgical procedures for over 15 years. To learn more about Fat Pearl Grafting, please contact us at today to schedule an appointment.